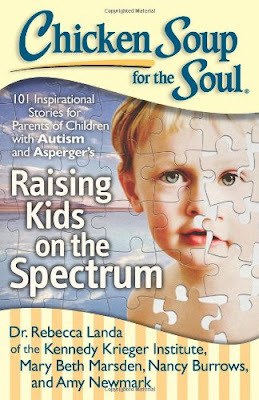 I've been a fan of the Chicken Soup books for years and I was so excited to see one for autism parents. 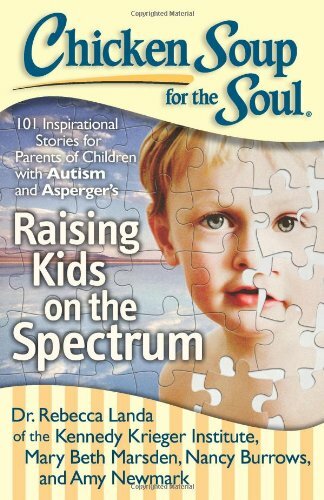 Five years ago, when my son was diagnosed with autism - this is the book I would have wanted to read. And I am so grateful that this is available now. What I love about this book is that the stories are divided in sections: Challenges, Finding the Funny, School and many more. The stories are short and easily digestible - you don't have to read this book in any kind of order. You can go to a section for a daily dose of inspiration. I read this book during my commute to and from work - I found myself choking back tears, laughing out loud and filled with hope. Two of my favorite stories were "Don't Stop Believing" by Liane Kupferber Carter - where she talks about what it took for her son to be able to get a hair cut and "Friendships" by Dawn Hentrich - a brutally honest post about the months after a diagnosis. Some of my other favorite autism writers/bloggers are also featured: Jean Winegardner, Laura Shumaker, Jennifer Bush and Leigh Merryday. There is something in this book for everyone. Whether your kid was diagnosed yesterday or ten years ago - you will see yourself within the pages of this book. all opinions are my own and have not been influenced in any way.